Recently, now that the weather (apparently) has started to warm up, all of the shops have been releasing their summer collections. In some ways, I think of this as a positive thing - the lucky lot of us that adore clothes seriously appreciate inspiration for summer. On the other hand, in England it's still way too cold to wear any of it! 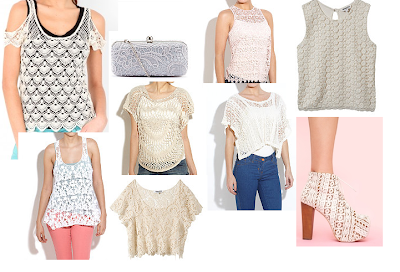 In particular I've noticed a few trends, pastels, baroque and crochet. Crochet never used to appeal to me: it seemed too boho for my particular style. This season I feel shops have *upped their game*, producing pretty and wearable clothes, with variations of the crochet trend. As you can tell from this, so far New Look is the real 'star of the show' - I love their pieces. Versatile in density of pattern, design, fit, colour and are all very wearable. My personal favourite is the sleeveless top from their teens section - it's very cutesy and summery. Saying this, I could do with a gorgeous pair of Litas! Have you been crushing over crochet recently? !